Is India neglecting its responsibilities to wildlife? The wild elephants are still in the area, but not too close to Lakeside. The forest rangers say that they have just come looking for food and water, but in yesterdays Hindu newspaper environmentalists say that part of the problem is the destruction of elephant habitat and ‘elephant corridors’ in the Reserve Forest, which is forcing them to change their range. Let me just emphasise: RESERVE FOREST, set up as a protection for wildlife and a buffer zone between them and humans. Why is human encroachment allowed? I would hate to think that people turn a blind eye for money. Or maybe there are just not enough people to enforce the law – if so there are plenty of poor local people who might be glad of such paid employment. I do hope that this is not another case of India neglecting her wildlife for selfish reasons. Everyone needs a break sometimes – including temple elephants in India! Every year the temple elephants got to a ‘rejuvenation camp’ for a 48 day holiday, as a ‘thank you’ for all their hard work during the year. Lot’s of elephants get together in their version of a summer camp and a good time is had by all! You may want to read this article in the Hindu newspaper to find out more. The first year they did this the people missed the elephants so much that they planned big celebrations and processions to welcome them back to their homes after the camp. The elephants were to be unloaded from their transport on the outskirts of the towns. The streets from there to the temples were lined with people, but the elephants had missed the temple so much that they didn’t wait for the procession, but just ran back to the temple and took up position once again to bless the worshippers! 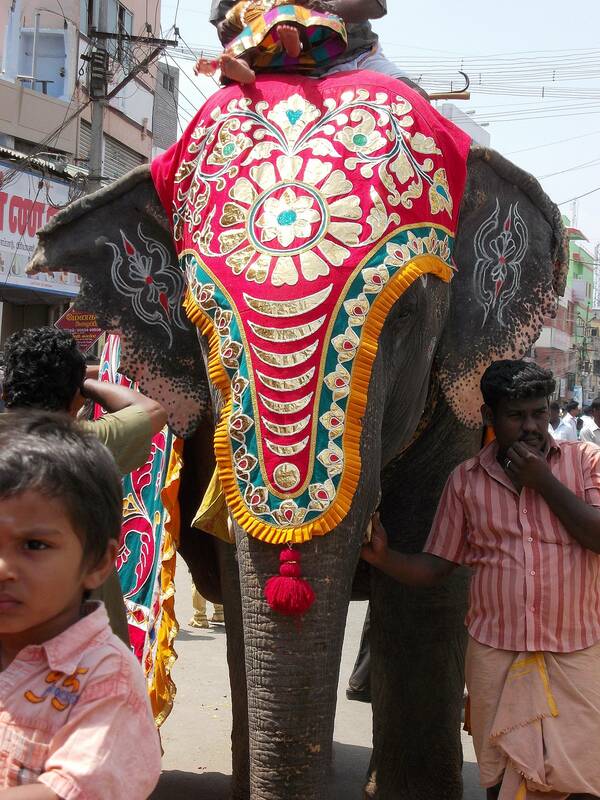 I’m sure the temple elephant I met with some guests in Dindigul is having a great time!